As well as making your curtains and blinds with passion and professionalism, we also offer a wide range of accessories, soft furnishings and decorative elements to harmonise with your rooms and complement your design ideas. These include curtain and blind fittings and trims, as well as matching cushions, chair upholstery, bedspreads and casual throws. 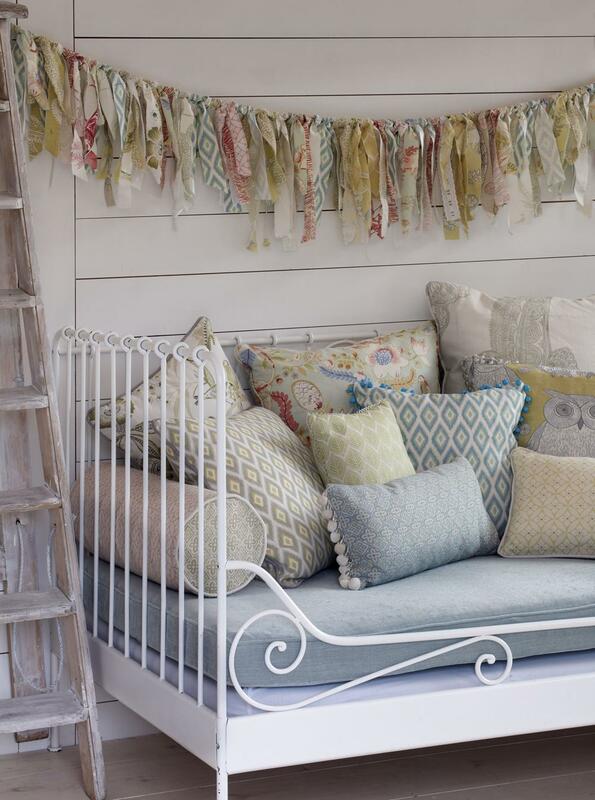 We also offer an upcycling service to re-use and re-purpose your old curtains and soft furnishings. For more information how we can complete your design scheme, just contact Wendy Jones at Renaissance . To finish your design scheme, we can make cushions in similar or matching fabrics to those used for your curtains or blinds. We can also create loose covers for sofas and chairs, seat pads, bedspreads, duvet covers, valances and covered headboards. 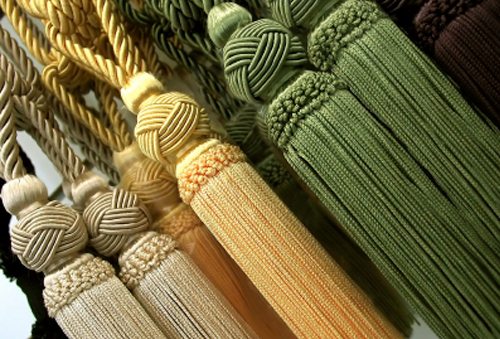 All are made with the same care, craftsmanship and attention to detail as your curtains and blinds, and all will look absolutely beautiful. 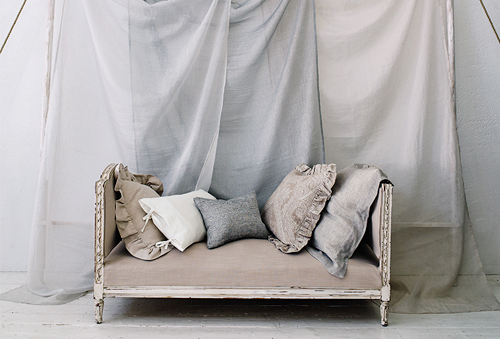 For information about our soft furnishings and upholstery, please get in touch . As part of our service, we will complete your curtains with matching tie-backs or metal hold-backs – depending on the style of curtain – along with decorative curtain tracks to suit every type of window and room. We also have a wide choice of metal, wooden and stylishly modern acrylic curtain poles, along with finials and caps in different styles. 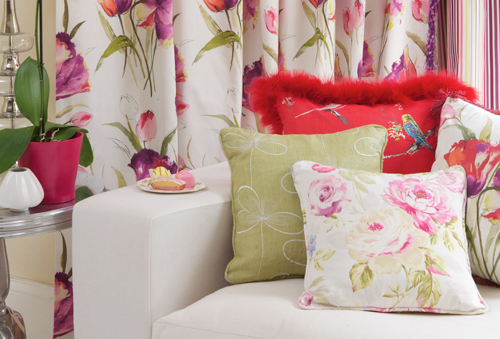 To arrange a visit to discuss your curtains or blinds, please contact us . Depending on your design style and personal preference, you may wish to box-in the top of your curtain or blind with a pelmet, which we can create and install in a style to suit your décor. Pelmets can be plain and understated, or can be covered in matching or contrasting material to that used in the curtains or blinds. The design can be elaborate or simple to suite your taste – these are all things we can discuss when we talk about your colour scheme and design preferences. For advice and information, and to arrange an initial discussion, please contact Wendy Jones at Renaissance . If you are replacing high-quality curtains or fabric blinds similar to those created by Wendy Jones at Renaissance – or maybe even replacing your ten-year-old Renaissance curtains - you are probably doing so because of changing fashions, or simply because you are refurbishing a room using a new colour scheme. If that’s the case, we will try to utilise the existing fabric, perhaps by unpicking and re-using the lining, or by dyeing the material into a colour to match your new colours. To find out more about our creative upcycling and to arrange an initial consultation to talk about your new curtains or blinds, just get in touch . "Thank you for our beautiful curtains. They look stunning! Thank you for all you hard work and patience." "Wendy is a very practical, realistic advisor and the standard of her seamstress work is exquisite. Her professional service is combined with a good sense of ‘what looks right’, and she is sensitive to the needs and budget of the customer. Living with Renaissance curtains will enhance your life!"